Daniele Bennati (Leopard Trek) was forced to withdraw from the Tour de Romandie in the first road stage today after coming down in a crash early on. As heavy rain fell on the race, the Italian sprinter came down after just 32km, in the town of Roche, and was unable to continue. Bennati was taken to hospital, where tests confirmed that he had a broken collarbone, which had multiple fractures, as well as four broken ribs and a contusion to his lung. He will require an operation to set his collarbone and it will likely be four to six weeks before he returns to racing. Not only is Bennati’s withdrawal and injury a blow to Leopard Trek’s Romandie plans, but the Italian sprinter was to have been central to the team’s plans for next month’s Giro d’Italia; with a likely return to racing in early-June, this will now be impossible. 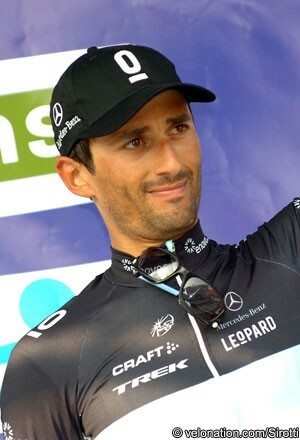 Not only will Leopard Trek have to come up with a new ninth rider for the race but, with the loss of Bennati, who took three stages of the Circuit de la Sarthe this month after a string of second and third places, the entire team’s strategy for the race will also have to change. With the Schleck brothers, and Fabian Cancellara, concentrating on the Tour de France in July, the team has no overall contender in the year’s first Grand Tour. Belgian sprinter Wouter Weylandt, who won the race’s third stage last year, may well become Leopard Trek’s best chance of Giro success.